From his days as the skinny kid on youth teams to his MVP season with the Oklahoma City Thunder to this first NBA Championship with the Golden State Warriors, Kevin Durant has been an electrifying presence on the basketball court. With two Olympic gold medals, four NBA scoring titles, and an NBA MVP Award, Kevin shows no sign of slowing down. Through every triumph, Kevin has lived his life by the motto”hard work beats talent when talent fails to work hard,” dedicating himself to becoming the best player on the court and known for remaining humble and kind through it all. 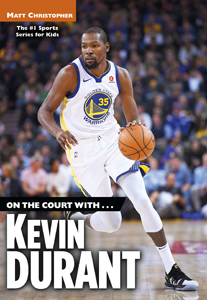 This action-packed and comprehensive biography brings readers onto the court to experience the biggest moments of Kevin Durant’s remarkable career, relays details of his life, and shows his dedication to giving back to this community. Complete with stats and photographs, this book makesdthe perfect gift for any young sports fan.